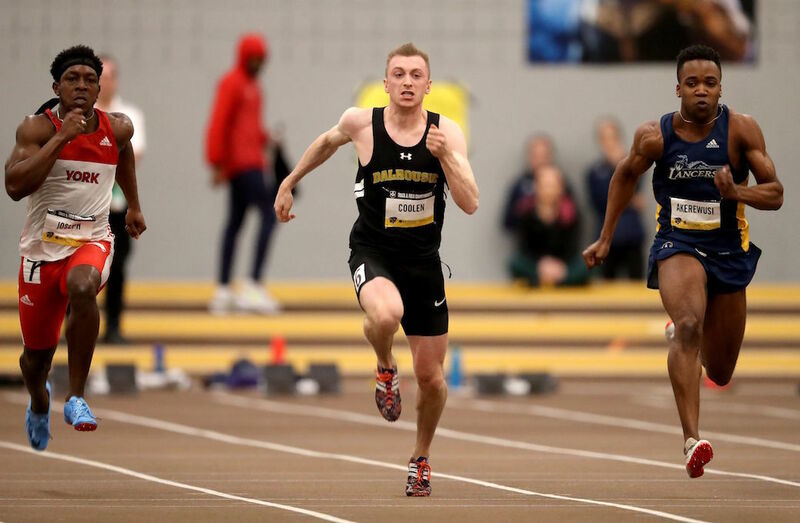 The Sherbooke Vert & Or and Dalhousie Tigers raced out to an early lead after day one of the 2019 U SPORTS Track & Field Championships, presented by Beynon Sports at the James Daly Fieldhouse in Winnipeg, Man. Sherbrooke’s 19 points on the women’s side came courtesy of two second-place finishes – one from pentathlete Amélie Augé, last year’s winner in the event – as well as Ariane Dubois in the weight throw. Fellow Vert & Or pentathlete Maude Léveillé also contributed three points with a sixth-place finish. Just behind Sherbrooke are the Saskatchewan Huskies with 14 points, most of which came from the combo of Nicole Ostertag and Ashlyn Mooney, who placed third and fourth respectively in the pentathlon. The Huskies' other three points were awarded to Michelle Harrison after a sixth-place finish in the 60m. Matt Coolen’s first-place finish in the 60m helped pace Dalhousie’s 12 points on the men’s side as he successfully defended his U SPORTS title with a time of 6.75 seconds. The time was his best of the season and a feather in the cap of the AUS Track Athlete of the Year. Dalhousie’s other two points came courtesy of fellow 60-metre runner Josh Lunda, who raced to a seventh-place finish. In second place in the men’s standings after day one were the Toronto Varsity Blues, who got eight points from 60-metre runner Alexander Lau, who also earned a silver last year. The Guelph Gryphons are just behind in third after getting six points from Kudakwashe Murasiranwa, who finished third in the 60m. Individually, Brittany Crew from York continued her dominant university career, capturing gold in the women’s weight throw with a toss of 18.78 metres. The 2016 Canadian Olympian was also honoured earlier in the day as the Outstanding U SPORTS Field Event Performer of the Year. Her 10 points also helped Guelph to a third-place spot after day one. It’s an honour to be here again and feeling good. Crew’s showing was even more impressive, considering the fact that she broke her foot in two places in the summer of 2018 and was forced to take eight weeks off. Not far behind with the silver medal was Dubois, whose best throw was 18.34 metres, also a personal best. The RSEQ representation continued with Noémie Jeffrey of Laval, whose throw of 17.55 metres earned her a bronze and was a personal best. 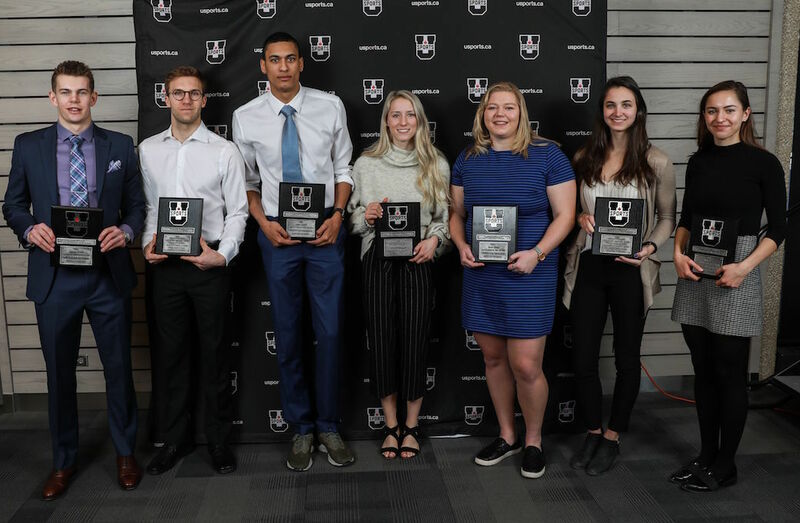 The women’s 60-metre race was won by the versatile Sandra Latrace, a multiple-time winner of the long jump at nationals as well as the 2015-16 U SPORTS Female Rookie of the Year. Her time of 7.42 was also a personal best on the year. Rounding out the top three were Bailey Smith of UPEI with a 7.49 and Maya Reynolds of Dalhousie with a 7.50. Rounding out the gold medal performances on day one was Niki Oudenaarden of Calgary, who claimed first in the women’s pentathlon with a total of 4,168 points. A member of Canada’s 2018 Commonwealth Games roster, Oudenaarden finished in the top three in all five events, including winning the shot put, long jump, and 800m. Day two continues Friday at the James Daly Fieldhouse, starting at 1:30 p.m. ET / 10:30 a.m. PT with the men’s weight throw.